Some cars either flourish and devlop, or indeed utterly flounder solely on the basis of the market conditions in which they are released into, and this is important to note because it is not so much a indication of the inherent quality of the car itself, but rather an indication of the times. When assessing the relative worth and merits of any given classic car, it is vital to be aware of the historical background of the car. The BMW Isetta 300 was truly a product of the environment in which it was designed and created, created and released for sale during the 50’s even though there was a massive increase in consumer spending, old habits die hard and so the rationing mentality left as a result of the 2nd world war influenced many a consumer, and captain of industry. Cars were a scarce commodity during the war, primarily due to the massive restrictions placed on the availability of fuel and also due to their high price tags as a result. With limited resources and with rather meager incomes many people were unable to afford cars either due unable to afford the purchase price outright or simply unable to maintain a car in terms of the associated running costs such as fuel and repairs. Adversity is often the mother of invention and so the market was positively ripe for a wily entrepreneur to devise a car that was cheap, affordable and economically viable in the long term. Along came the BMW Isetta 300, a functional little car that whilst sorely lacking in the good looks department (with many a rather cruel joke comparing it as a refridgetor on wheels) compensated in terms of efficient transport. Whilst the BMW Isetta 300 was no racing car (reaching a grand speed of 30 mph in half a minute) many consumers were pleasantly surprised at its remarkably efficient fuel consumption which stood at around 50 miles to the galleon a previously unprecedented amount. By today’s standards this may seem rather meager, but when you consider that the overwhelming majority of people travelled by means of bicycles and scooters then the true potency of the BMW Isetta 300 becomes more evident. When it was released in the US, the BMW Isetta 300 was met with a near universal critical acclaim, winning over consumers from all sectors of society. 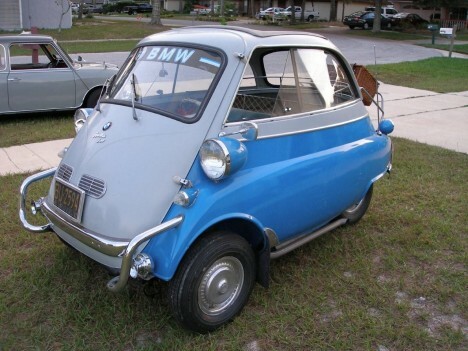 The BMW Isetta 300 did not fair quite so well in the UK market, and initially sales were sluggish to begin with. With some modifications made, primarily the change from one door to three proved to be highly successful meaning that the BMW Isetta 300 soon became an overnight smash sensation with the UK market and import figures quickly trebled. As a direct result of the success of the BMW Isetta 300, the BMW company quickly invested greater amounts of time and money in order to develop the 600 model.